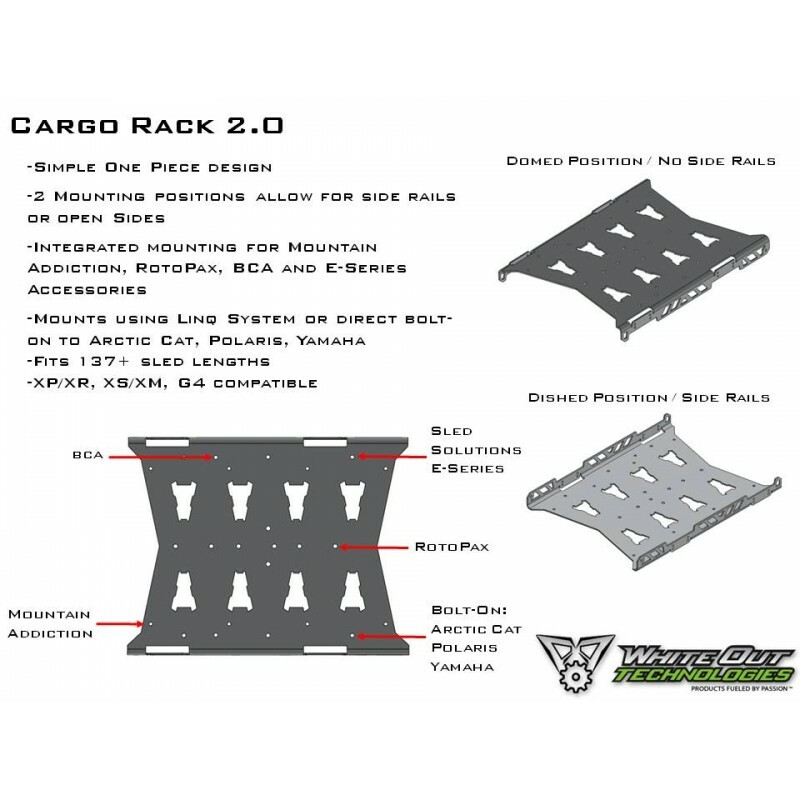 Cargo Rack 2.0 was designed to provide a non-invasive platform for mounting popular aftermarket accessories utilizing the Ski-doo™ LinQ™ system. 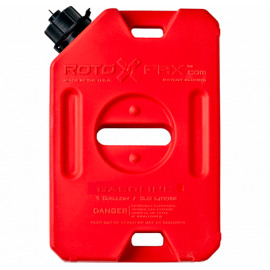 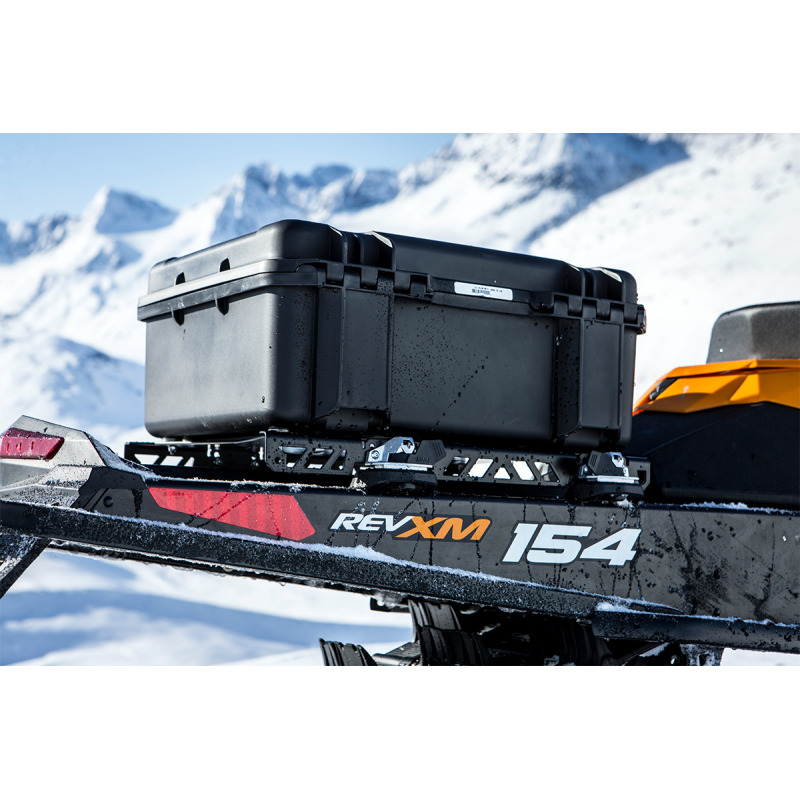 -Provides real estate for mounting accessories to the new Ski-doo™ G4 platform, where drilling through portions of the tunnel is no longer an option due to the cooling package envelope. 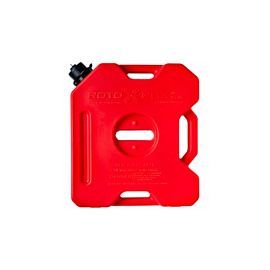 -Lightning holes are designed to minimize weight, yet leave plenty of real estate for custom applications where drilling custom holes for other bags and accessories is desired. 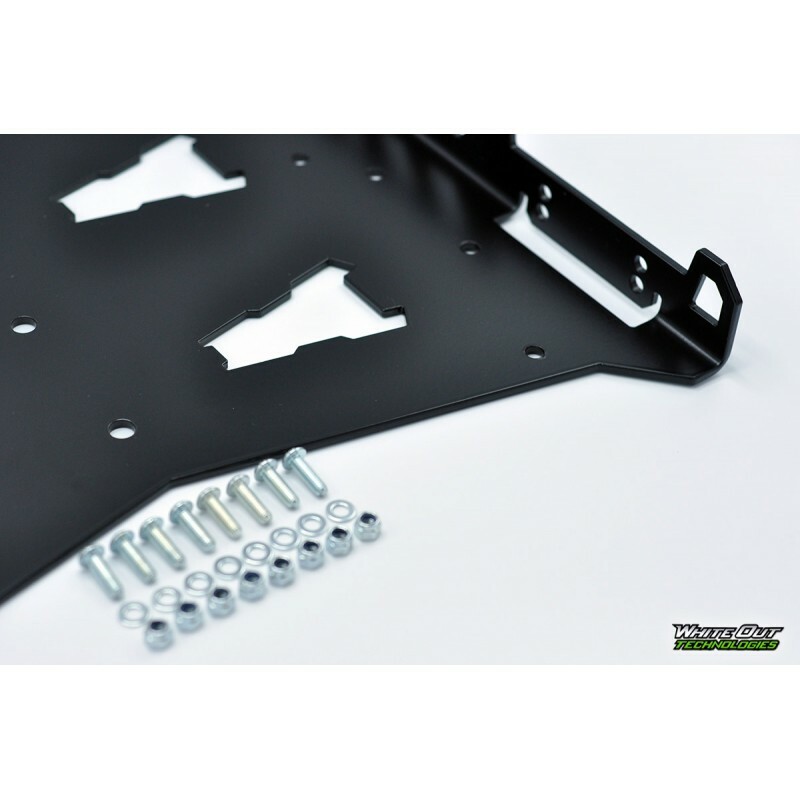 -Fits Ski-Doo™ 137" and longer tunnels and can be integrated on Arctic Cat™, Polaris™, and Yamaha™ sleds utilizing our popular Adapt-Link product or by directly bolting the rack to the sled. 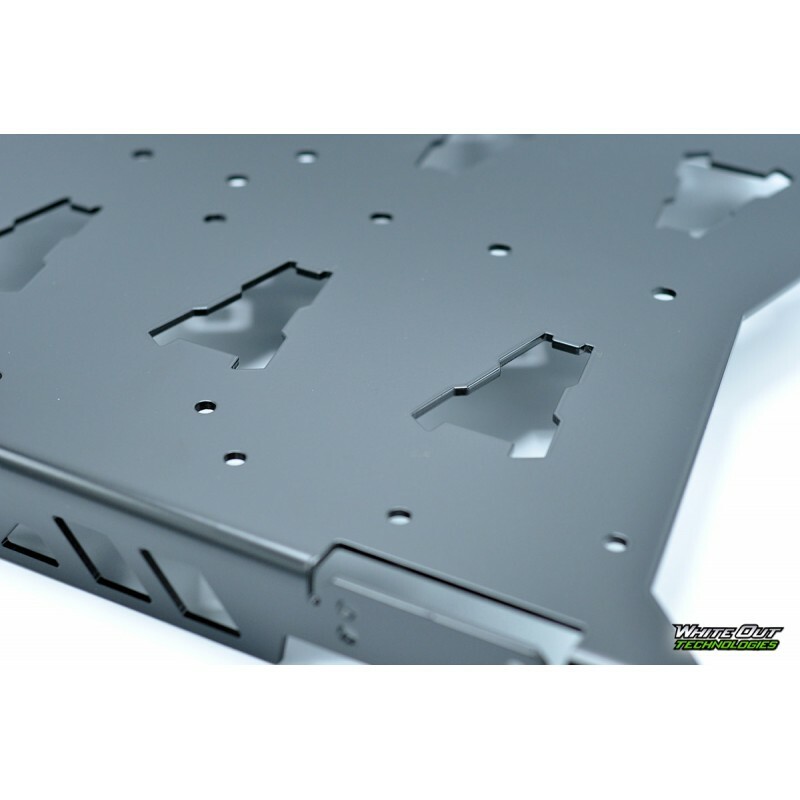 Holes in the rack line up with the Polaris™ "T-Slot", and outside of the cooler on Arctic Cat™ & Yamaha™ tunnels, allowing for a simple installation. 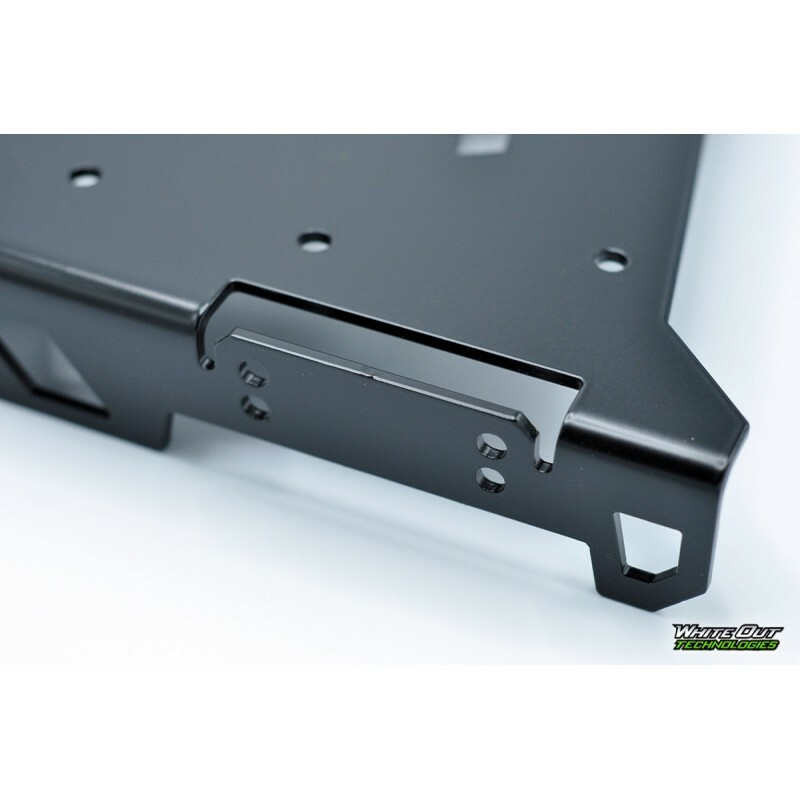 Note: LinQ™ latches are not included with rack 2.0. 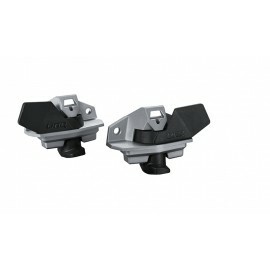 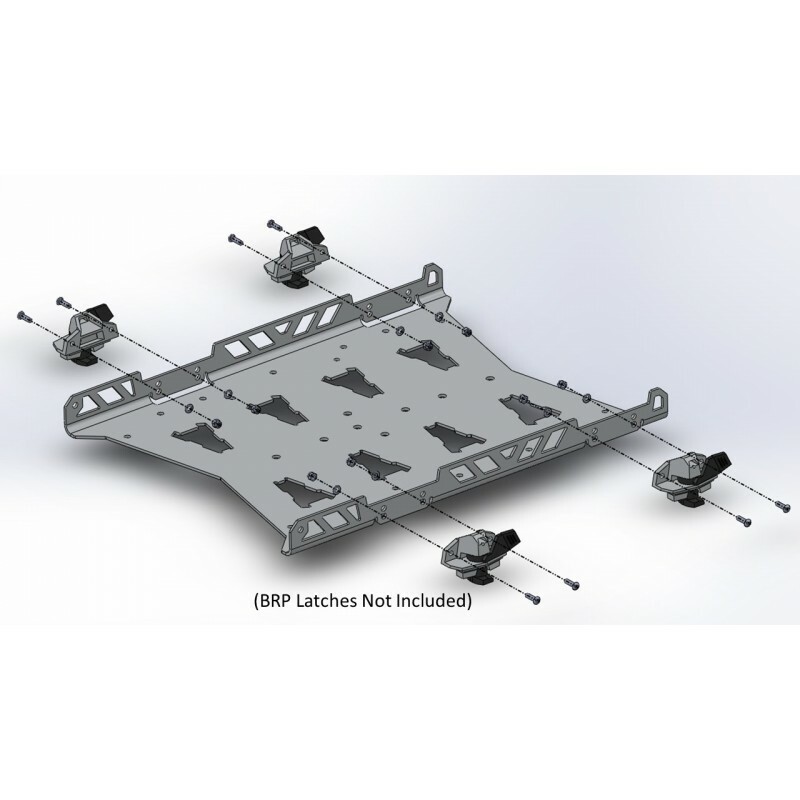 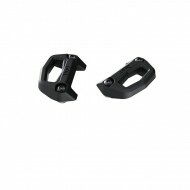 Rack will require two (2) pairs of latches (BRP P/N: 715001707). 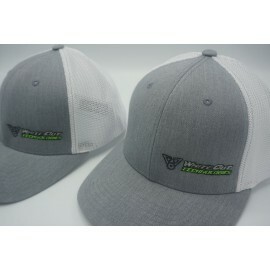 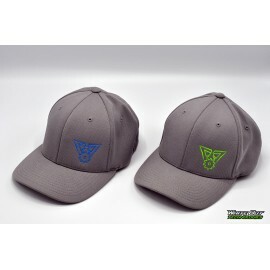 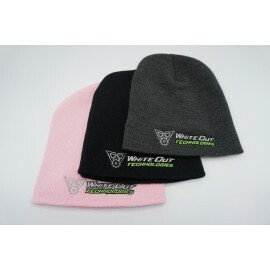 These are available from your local Ski-Doo dealer, online, and our website. 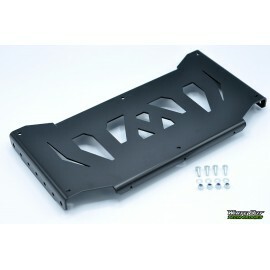 New from White Out Technologies is our Cargo Rack 2.0 for the Ski-doo™ LinQ™ quick-attach system! 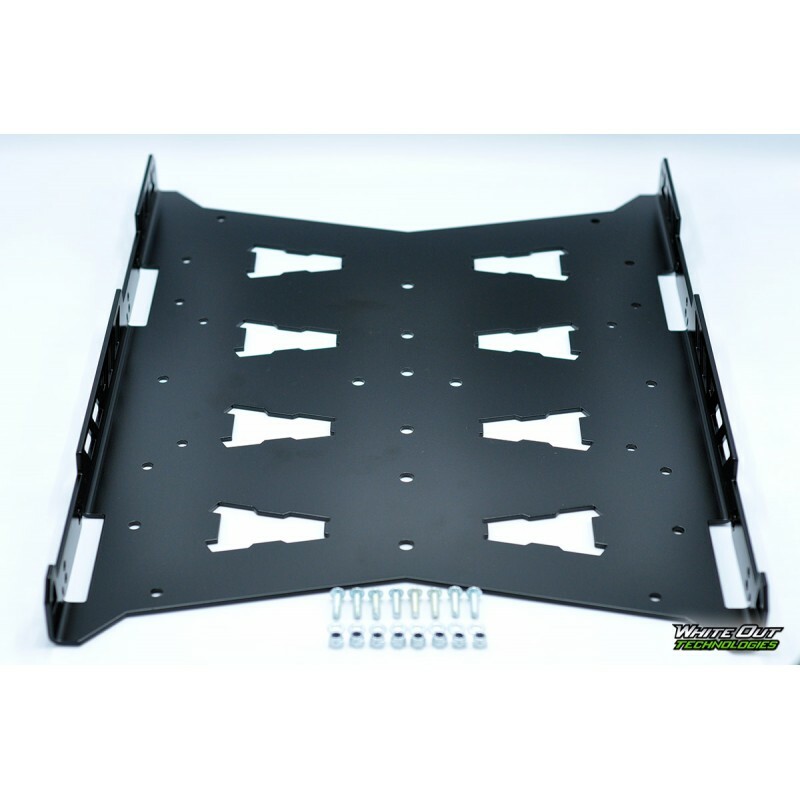 Similar to our first generation cargo rack, this one-piece rack was designed with ease of installation and accessory adaptability in mind. 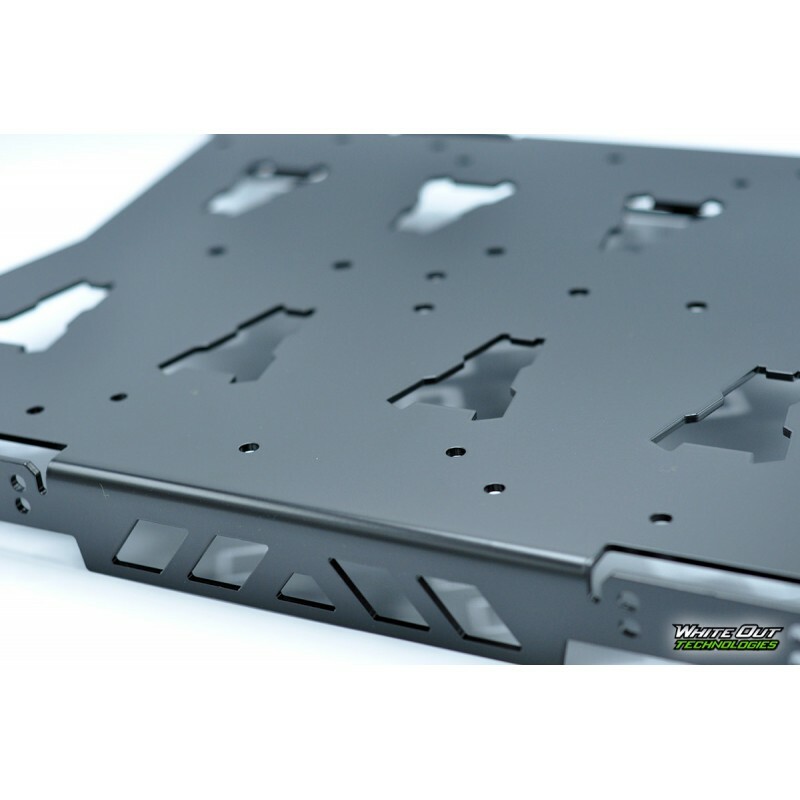 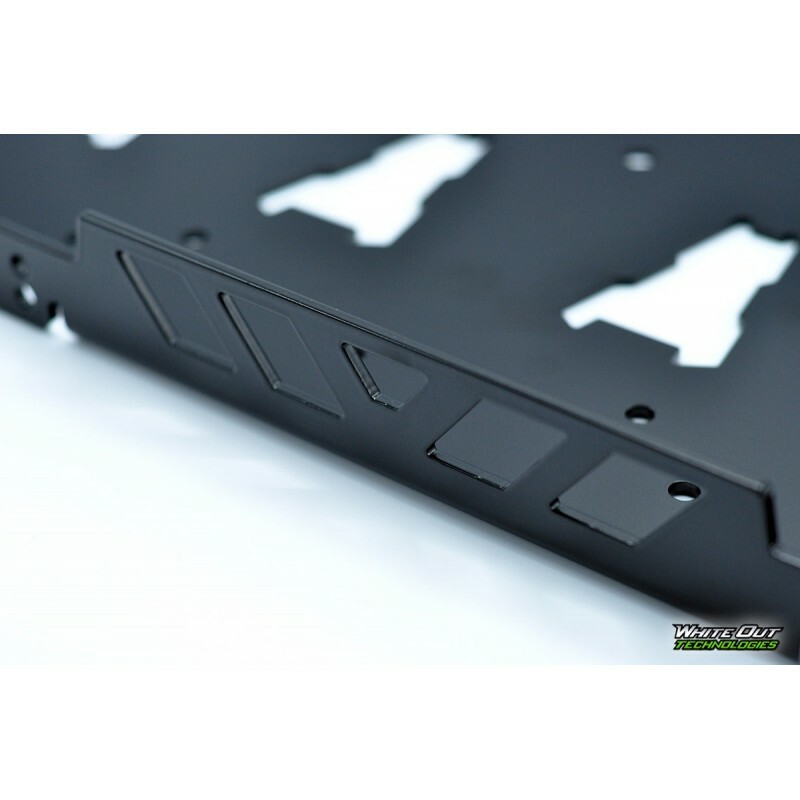 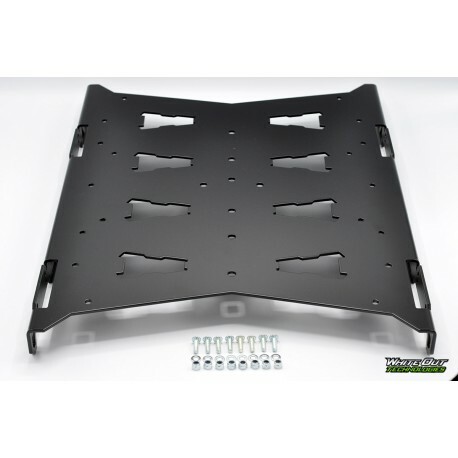 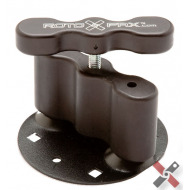 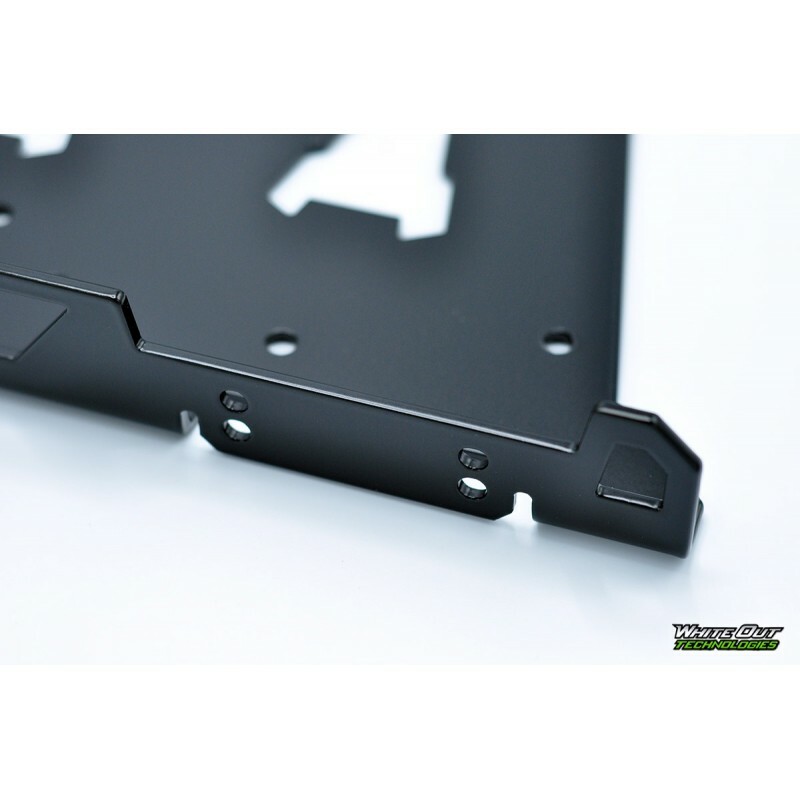 We integrated mounting holes throughout the rack that are predefined for popular aftermarket accessories including Mountain Addiction, BCA, Roto-Pax, and Sled Solutions products! 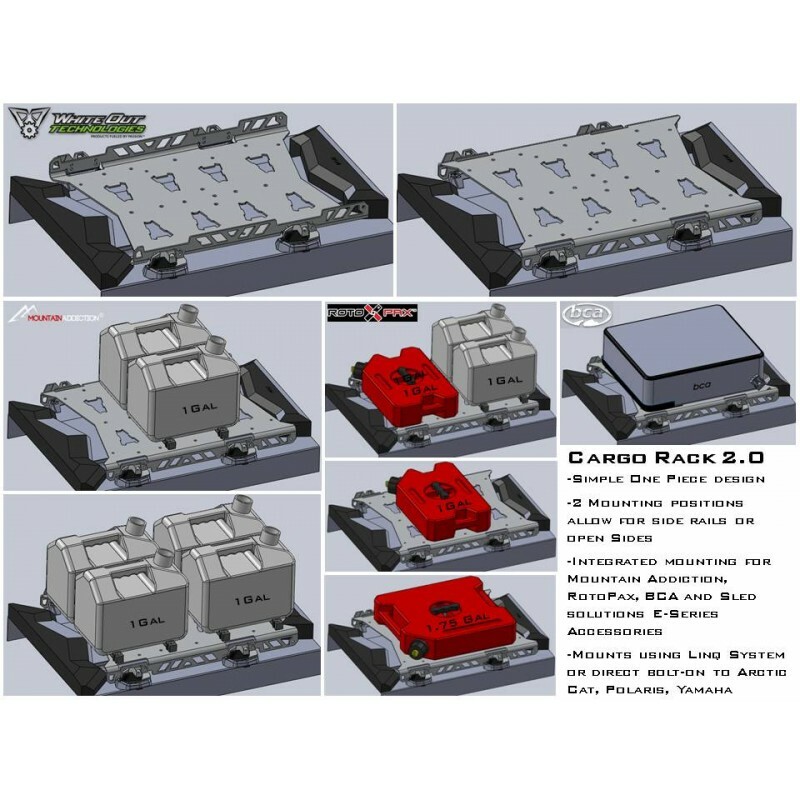 Our Cargo Rack 2.0 is laser cut out of aluminum to provide clean lines and a lightweight solution for mounting accessories to your sled. 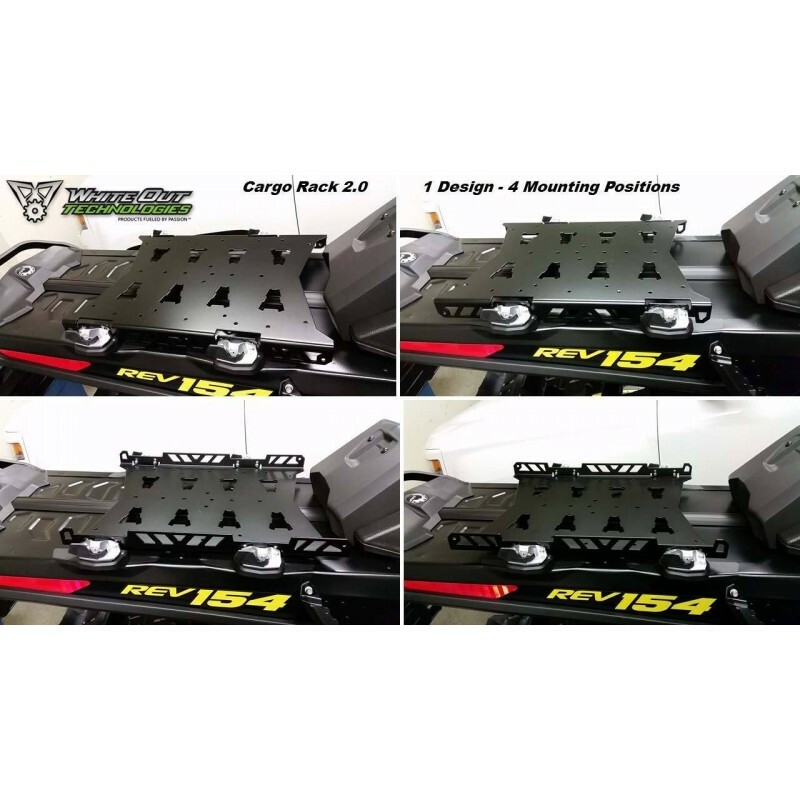 When using the LinQ™ system, our Cargo Rack 2.0 can be mounted to XP, XR, XS, XM, and REV G4 sleds with 137" tunnels or longer! 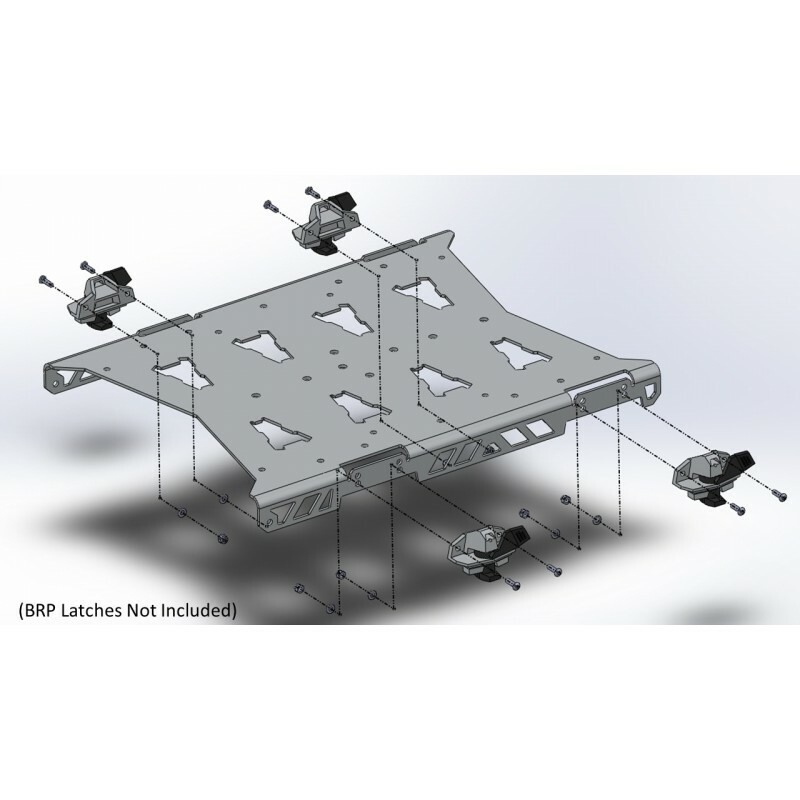 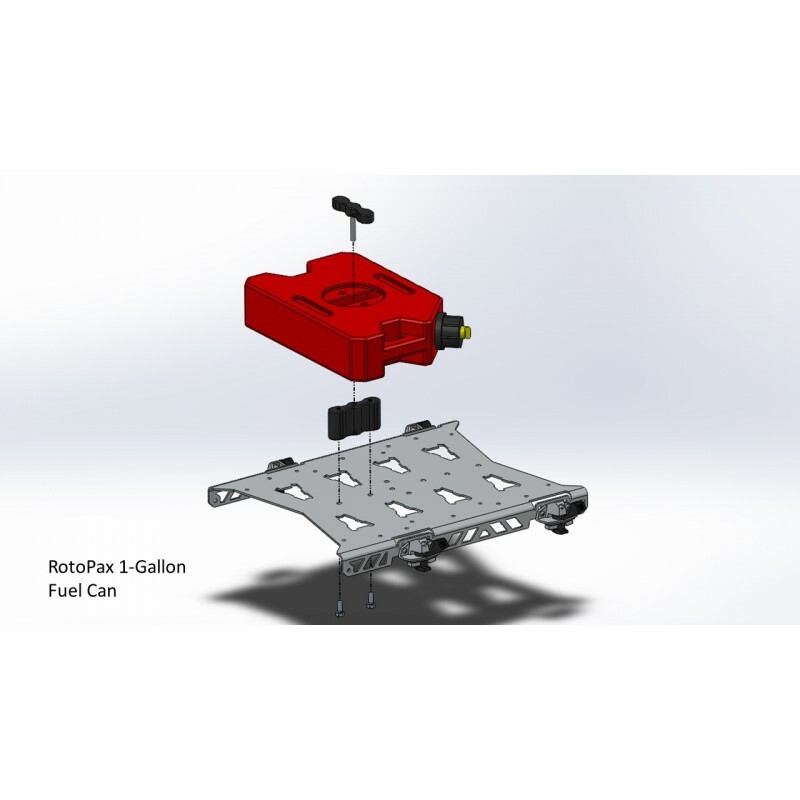 Our industry-first design allows the rack to be installed in two different orientations depending on the application. 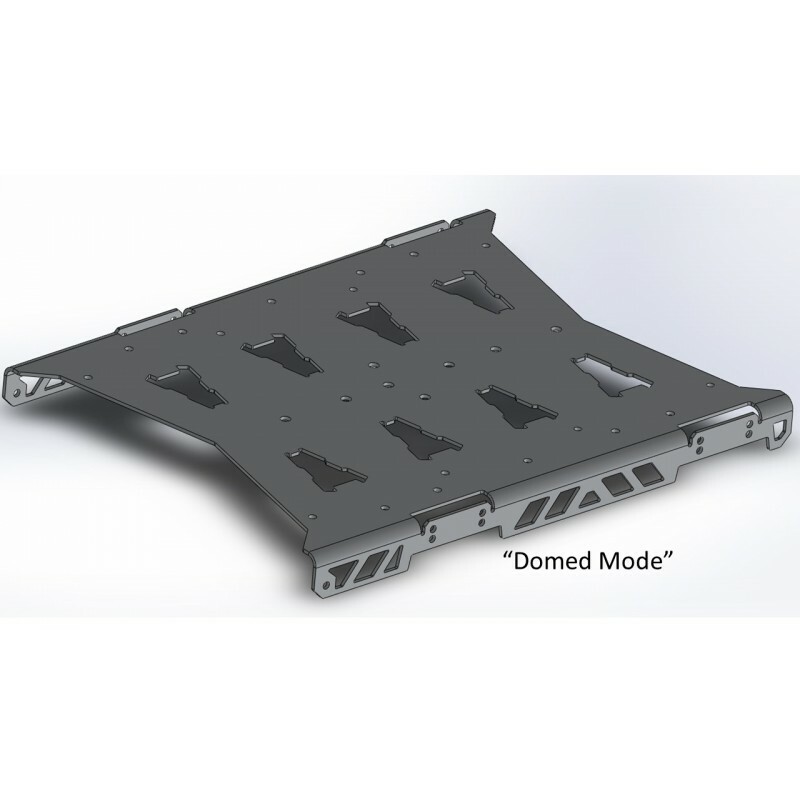 Mount the rack in the "domed" orientation to have a smooth mounting platform above the LinQ™ latches, or flip it over and install it in the "pan" mode where the rack sits closer to the tunnel and has integrated side-rails for strapping down bags and other accessories! 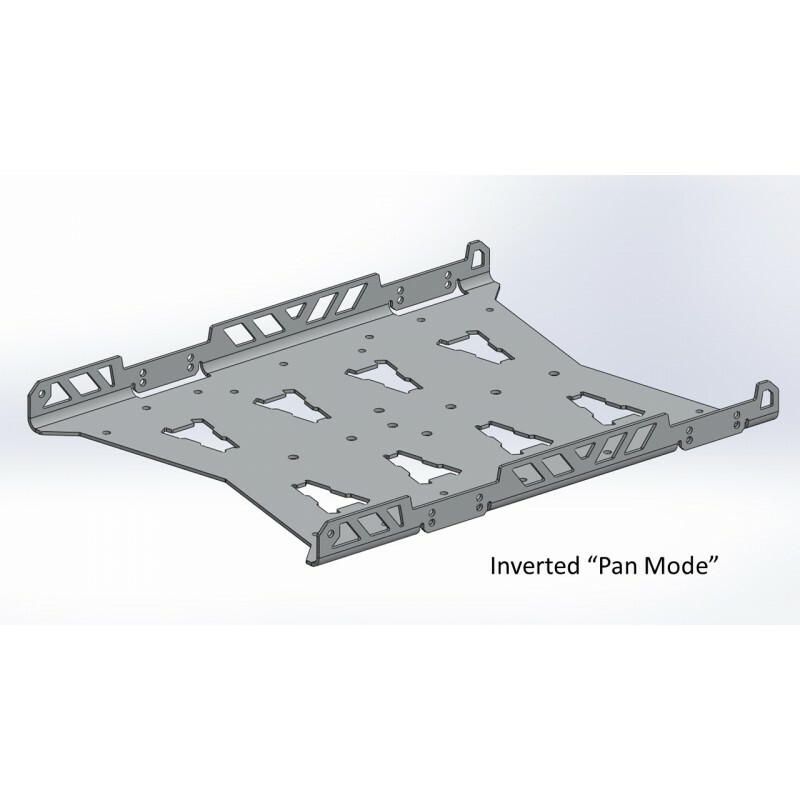 In both orientations, additional side-rails are not needed as there are holes meant for strapping down items, adding to the functionality of this rack! 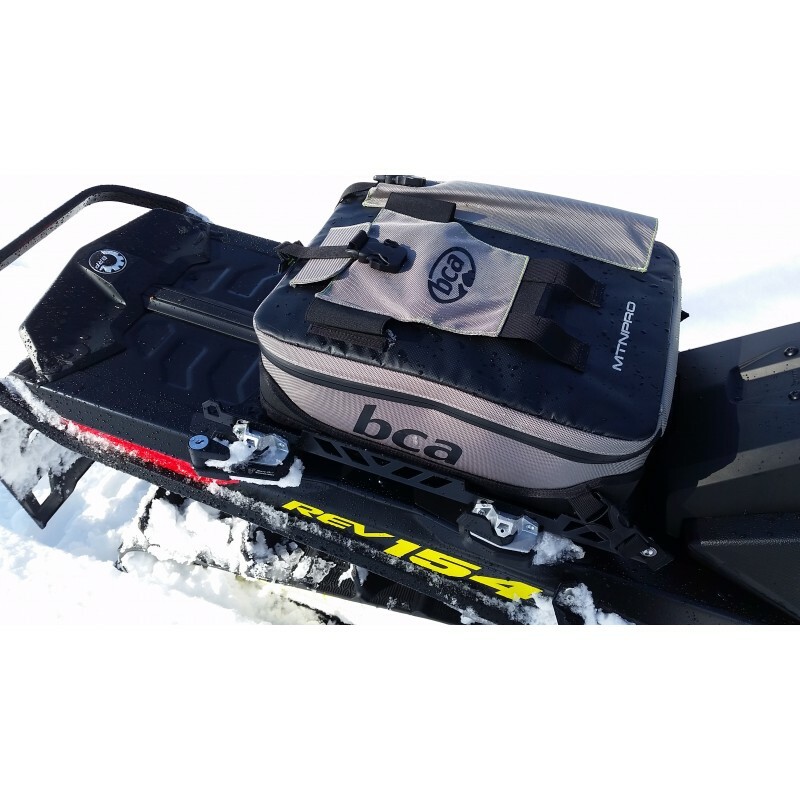 *Ski-doo™ Latches and Base Kits are sold-separately on our website (see accessories below) and are not included with Cargo Rack 2.0. 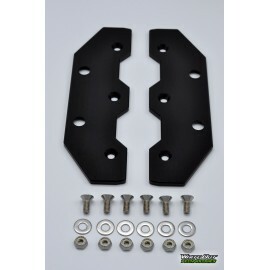 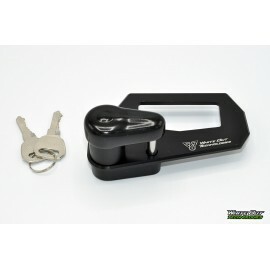 Screws, washers, and nuts necessary for securing the Ski-doo™ latches to the rack are included. 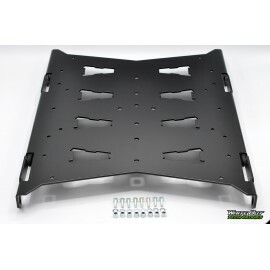 See a quick video of Rack 2.0 here!